Working for yourself is amazing, but not when you’re putting in 70+ hours a week trying to do everything. 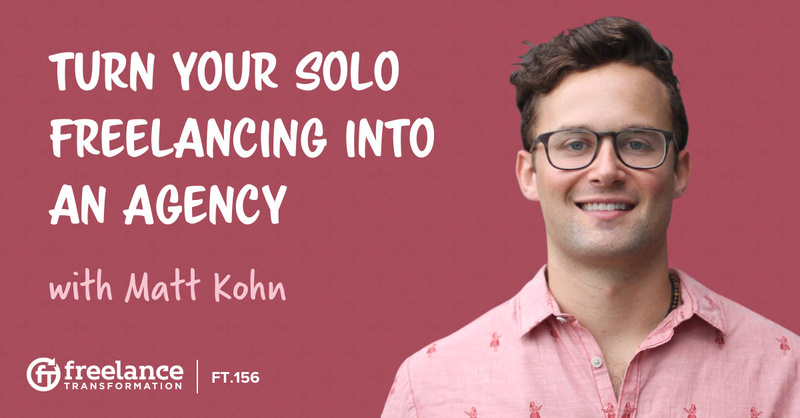 Matt Kohn quit his full-time job just two years ago. That meant hustling and taking any job he could get in order to build a reputation and a client base. But building your own business is more than just living off your skills. Everything that made you successful as a freelancer is everything that is going to prevent from growing as a business owner. We’ve all reached that point in our business. You have too many projects on your plate, yet you still aren’t earning enough to live the life you want. Freelancers often plateau before they move on to the next big thing. And for Matt, that next big thing was opening his own agency. In order to turn your freelancing gigs into your own business, Matt says you really need to change your mindset. Stepping into the role of business owner requires what Matt calls a “mental shift” that many freelancers aren’t aware of. You can’t say 'yes' to every project and every client, and you need to start creating boundaries that give your business its structure. Finding that structure doesn’t come easy. How do you know what that kind of foundation looks like? Matt recommends hiring a coach or mentor to help you develop the mindset and create those systems that make a structured business possible. Whatever system you’re trying to create…you want to get down the key milestones and the key steps that occur from Point A to Point B. Systems are just processes you put in place in order to do what you do as a freelancer. And you should have a system for everything. Lead generation, creative projects, and bookkeeping should all have a standardized process so you can guarantee that you’re doing everything correctly every time you do it. Start by standardizing your core delivery processes, the ones that the clients are paying you for. Start by putting things in a step-by-step process. It may sound tedious now, but it’s going to be helpful in the future. Creating these systems is the first step to scaling your business. Matt shares his own personal design process and his scaling tips for delivery, sales, and lead generation so you can understand how these kinds of systems work in real time. And once you’ve broken your business model down to its tiniest steps, you can use those steps to create training programs for new hires. Hiring people isn’t as simple as just hiring someone to do the work that you do. One of the biggest mistakes Matt sees business owners make is trying to hire someone without having systems in place. Most of the time, these freelancers try to hire people when they’re already drowning in work and it’s almost too late to make time to properly train a staff. Leading with your systems means you already have a training program. Matt recommends taking apart your system etiquette and reformatting it for a job description. This gives your new employee clear expectations, and it also gives you a form to follow so you can train them in the right way you do business. The sooner you do this, the lower the risk it is to your stress level. Matt’s advice is to start small and hire a virtual assistant for a few hours a week to see how well your systems work and translate for training. You’re allowed to make mistakes during this process, so give yourself the extra room to learn from those mistakes and create better processes. The better your systems are, the stronger your business foundation is, and the faster you can build a team. You definitely want to be somebody who’s excited about leading a team. Hiring a team gives you the opportunity to take on more work and earn more money, but it also means you have a lot of responsibility managing a larger team of employees. Many freelancers are fine to manage themselves, but managing more than one person is not as easy as it looks. Matt shares his own management tips, what apps he uses to help keep tabs on his team, and how building a team from the bottom up means being hands-on throughout the entire process. Matt shares a lot of important information today. His vision for what he wanted his business to be was only possible when he created the system of processes. The system is what made it possible for him to scale and move on to bigger and better things. But the biggest piece of advice that Matt shares in this episode is how to scale your referral process. Requesting referrals from clients can be as easy as making it a priority after completing so many projects for them. Matt recommends incentivizing the referral process by offering clients a discount if they can refer you to some of their colleagues. You are building a referral machine as you grow that will continue to scale. Creating this so-called “referral machine” means you need to niche down. It is something discussed in a lot of episodes of the Freelance Transformation Podcast, but niching down is so important if you want to be a successful business owner. Take time to identify what kinds of clients you want to serve and what your arsenal of unique skills can bring them. Remember, you’re a specialist, not a generalist, and you need to remind clients why they chose to work with you. Matt’s biggest takeaway from today’s episode is how to keep a personal touch. Your clients and the people you work with will care about how you impacted them. They will remember what it felt like to work with you, and they will continue to work with you and recommend you to their friends if you can make their time with you a truly rewarding experience.